Bryant Park is excited to host a new performance-based public artwork by Kate Gilmore. 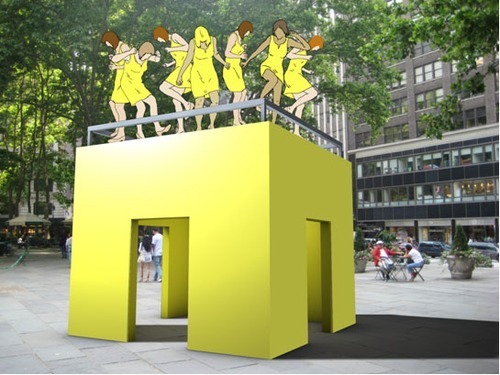 Presented by the Public Art Fund, Walk the Walk is a dynamic installation activated by seven women who will walk, shuffle, and stomp atop a cubic structure on the park’s Fountain Terrace for five business days in May. Clothed in simple yellow dresses and beige pumps, Gilmore’s performers transform the workday into a visual spectacle and dissonant symphony. Once inside the structure, visitors will hear the reverberations of the stomping feet overhead, inserting them into a dramatic, improvisational audio piece. Walk the Walk draws attention to the vast number of women who work in New York City every day. It questions the notions of work, its limitations and possibilities, and the themes of female identity, physical endurance, and personal expression. The artist is best known for her single-channel videos of private performances. As the main subject in these videos, Gilmore attempts arduous physical tasks while wearing stereotypically feminine clothing and shoes. One such piece, Standing Here (2010), is currently on view in the 2010 Whitney Biennial. Walk the Walk is Gilmore’s first public installation and the first time she has orchestrated her work for other performers. For more information, visit www.publicartfund.org.